Ko Phi Phi Don ("ko" meaning "island" in the Thai language) is the largest island of the group, and is the only island with permanent inhabitants, although the beaches of the second largest island, Ko Phi Phi Lee (or "Ko Phi Phi Leh"), are visited by many people as well. There are no accommodation facilities on this island, but it is just a short boat ride from Ko Phi Phi Don. The rest of the islands in the group, including Bida Nok, Bida Noi, and Bamboo Island, are not much more than large limestone rocks jutting out of the sea. Ko Phi Phi Leh was the backdrop for the 2000 movie The Beach. Phi Phi Leh also houses the 'Viking Cave', from which there is a thriving bird's nest soup industry. 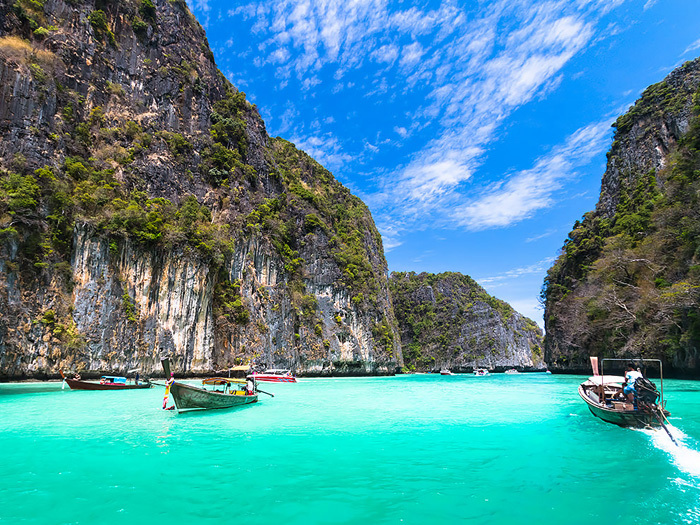 There was criticism during filming of 'The Beach' that the permission granted to the film company to physically alter the environment inside Phi Phi Islands National Park was illegal. The controversy cooled down however, when it was discovered that the producers had done such a decent job of restoring the place that it finally looked better than it had done before. The Phi Phi Islands were also the setting for the hide-out of Scaramanga in the James Bond Film "The Man with the Golden Gun." Following the release of The Beach, tourism on Phi Phi Don increased dramatically, and with it the population of the island. Many buildings were constructed without planning permission. Ko Phi Phi was devastated by the Indian Ocean tsunami of December 2004, when nearly all of the island's infrastructure was wiped out. Redevelopment has, however, been swift, and services like electricity, water, Internet access and ATMs are up and running again, but waste handling has been slower to come back online.